Private Stock Shilohs and Azzaro Shilohs are excited to announce the upcoming breeding of Mercy & Zeus. We expect these two exceptional Shilohs to produce great sweet temperaments, good health, outstanding size and bone, big gorgeous heads, and solid movement. This should be an all plush litter, with dark muzzles and beautiful pigment, in varying shades of grays and silvers. Mercy is an extremely loving, sweet tempered girl. She is easily trained and always eager to please. She is our “huggie bear, “always wanting to be touched or massaged. She turns her body to the spots where she wants you to massage then she gives big kisses as to say thank you. Mercy has a gorgeous grey sable plush coat, good bone and height, broad chest and the most amazing almond eyes that make you melt with just one look. She attracts attention wherever she goes! She loves other dogs and cats; all she wants to do is play. Mercy has proven to be wonderful in the show ring too and is now a Breed and Club Champion. As a puppy in the ring she showed her spirit, obtaining her puppy and Jr puppy championship in 1 weekend. She has passed all of her health testing and is now ready to try motherhood. 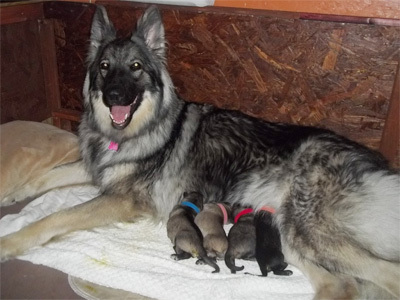 We believe, with her great temperament and loving ways, she will make a fantastic mother! 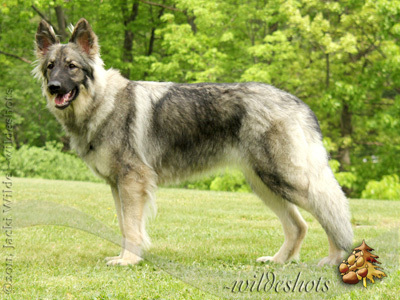 Zeus, with his big broad magnificent head, extremely large bone, stunning silvery-gray sable plush coat and those expressive eyes that just steal your heart with a single glance, coupled with an awesome mellow temperament too, Zeus is the total shiloh package. Zeus carries forward the original foundation dog bloodlines, with a true regal presence, commanding attention and stopping traffic, wherever he goes. 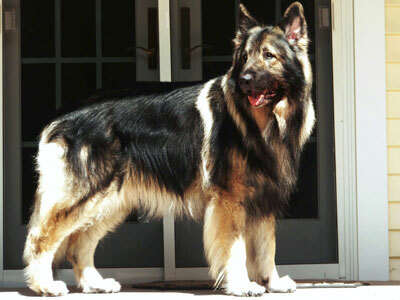 Zeus is a true gentle giant, he travels with us everywhere, including Northern Europe, Italy and Switzerland. He is always the patient perfect gentleman, whether kissing an infant, or strolling through a busy crowd on a city street. He makes us so proud every single day! Zeus has also proven himself and produced some incredible progeny with great temperaments and abilities in many different fields, including therapy and service work, reading programs for children, conformation showing and a variety of other venues. Of course, Zeus has produced the most awesome sweet loving pets and companions anyone could ever ask for! We believe that Mercy and Zeus complement each other perfectly and look forward to this outstanding litter. We expect our baby bears, Oops, we mean pups, to have stable soft to medium soft, loving temperaments, easily adaptable and able to be the perfect addition to any family. These pups will be loveable, easily trained and successful in any venue their new owners may plan for their future.